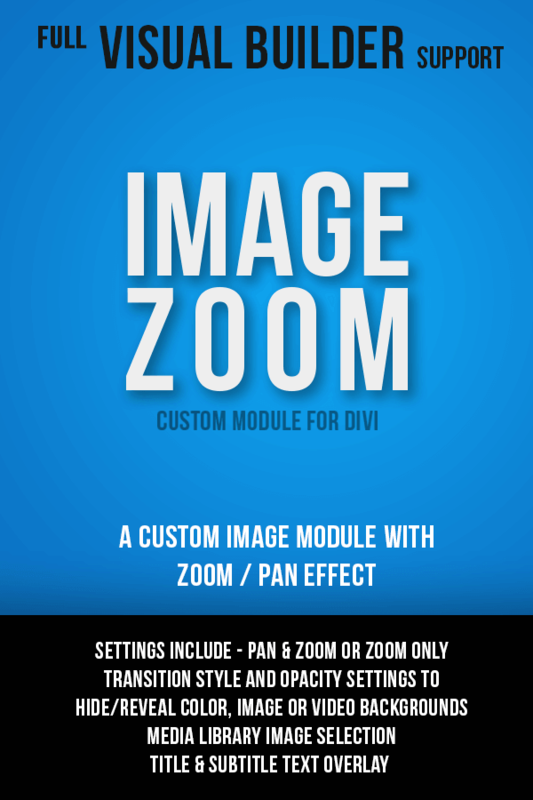 The Image Zoom Module is a custom Divi image module featuring a Pan & Zoom effect on hover. Using the module is easy. Simply choose an image from the media library or enter the url of an image online. Choose which size image to output on the front end from the various options available in the module. Add Alt and Title tags as required. Add a link URL, a Title and Subtitle if required. These are centered vertically by default (using CSS Flex) and are adjustable in the Custom CSS Settings. Switch on the Zoom Effect or Zoom and Pan Effect and set the Zoom Amount and transition Speed in the Zoom Settings tab. The image you select is used as a background image and unlike the standard image module there is no lightbox option. A small JS snippet sets your chosen Zoom level on hover at the selected transition speed, scaling the image up or down using a simple CSS transform. The Image will also Pan in relation to the position of the mouse cursor when the Pan effect is enabled. The two text fields are optional and can be used to display text over the image. Adding a link to the Link URL field will make the entire module clickable and you can do this with or without using the Title or Subtitle. In version 2.0.0 you can now add a background color, gradient, image or video and reveal or hide them on hover with the new Opacity options in the Zoom Settings Tab. The usual Divi settings for the text fields are included, as well as padding, margin, box-shadow, border and animations and filters. The Custom CSS boxes in the Advanced tab consist of the main element, the text content container and both of the text fields. There is also a Custom CSS box for the text content container hover state, as well as hover states for the Title and Subtitle fields. This makes it very easy to animate the Title and Subtitle text. Check out the Demo page for some examples.